6-10 weeks courses or 'one off'. Gift Vouchers available. Join or start any time. various mediums & techniques: pencil & graphite, charcoal, pastels, mixed media, acrylics, ink/ watercolour. “Sketching and studying from Still Life and Portrait, using different mediums and techniques"
Sketching and studying from Still Life and Portrait. Introducing 10 different ART mediums and techniques during 10 weeks course. Working from Still life, Portrait (or abstract, if prefered) topics at choice. Materials not included. Some materials may be provided for specific topics. Fees: £60/per person/ per 6 weeks. Payments in advance. 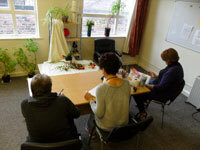 Study "Still life", "Portrait" and "Abstract art" related topics, observational drawing, painting, mixed media, experimental sketching techniques with a qualified tutor and artist. Find your favourite medium, talent, strenghts, creative joy and relaxation, discover new techniques, explore experimetal work, develop and refresh your mind, soul and skills in general through observation and playfulness. Generally, classes may be accompanied by soothing classical music, and are taught by a qualified artist and teacher. visit our workshops page for more. 1:1 Art Tuition is also available by request. Why not treat your loved ones with a leisure creative session gift voucher? Cost generally does not include materials: £8/per person. Concessions only when larger groups attending. 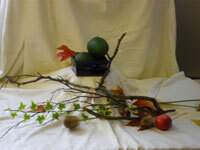 Introduction to Oriental brushwork techniques and applying to landscape, still life and abstract topics. textures, etc. using inks, watercolours, gouache. A 5 weeks course. Materials not included. Please, bring your own materials including an A3 sketch pad . Fees per 1 hour and 30 minutes: £10/pp/ session. Payments must be done in advance, please. £50.00/5 weeks course/pp. Materials not included. Please, bring your own. Love pastels and other drawing mediums? 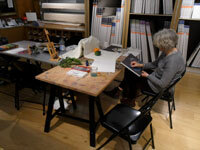 Join in and learn more about composition and drawing, colour and experiment various mediums and techniques. Learn tips about composition, contrasts, perceiving colour in ‘light’, revise colour wheel theory and work with oil pastels or soft pastels. Bring an A3 sketch pad and pastels of your choice, pencils. Explore a variety of experimental methods to create monoprints, using drawing, painting and mixed media. Materials not included, please, bring an A3 sketch pad and some pencils, graphite sticks, acrylics or block printing paint, roller, brushes. A 5 weeks course. Materials not included. Please, bring your own. From old, modern and contemporary influences try this 10 weeks course to discover techniques and experiments on artistic/ ornamental calligraphy designs whether for book illustration, art, poster design or simply gift wrapping paper ideas. Using brushes and nibs, you will experiment with a variety of water based medium and tools on paper grounds to learn how to create lettering and ornamental calligraphy designs for your intended purpose or simply for a delightful practical experience. Colour theory and application exercises included. Fees per 1 hour and 30 minutes: £10/pp/ session. Payments in advance, please. Bring along that plasticine or clay and play again, creating interesting small sculptures or bas-reliefs. By appointment only at either venues mentioned below. Fees as mentioned above. Please, note: By advance booking/appointment and confirmation only. Limited places available. Other slots for 1:1 tuition are available by appointment. Please, enquire. Thanks. 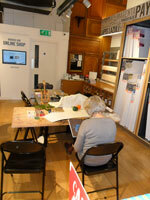 Study drawing, painting and mixed media topics with ‘Still Life’ settings, ‘Portrait’ or abstract experiments. Bringing along your own materials is a must, unless arranged otherwise with the teacher.
! Please, note: These fees do not apply to specially designed courses. Please check fees individually/course. Thank you. Due to change of store circumstances Times remain to be confirmed (tbc) with your first appointment.